Carolyn Hill flanked by supporters as we were gathering on sidewalk in front of DHS with the city’s Christmas Village in the background. 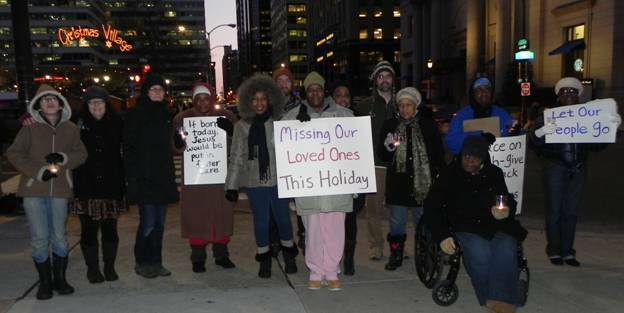 About 20 people, mainly women of color, braved the cold to join Carolyn Hill outside the Department of Human Services in lighting candles for loved ones we are separated from this holiday season due to the foster care system, prison system, immigration policies, poverty, war… Ms Hill’s nieces were taken from her care by DHS because she lacked a GED. This is her second Christmas without them, and they without her. It was announced that Kimberly Rivera has been freed from prison and reunited with her newborn and family for the holidays. But Chelsea Manning, Mumia Abu Jamal, Maroon Shoatz, the Dallas 5 (among them Andre Jacobs, Anthony Locke, Carrington Keys, Duane Peters), the CA Prisoner Hunger Strikers and many other family members who were remembered on this day with the lighting of candles remain separated from us. The candlelight vigil was covered by Channel 10 NBC Local News. 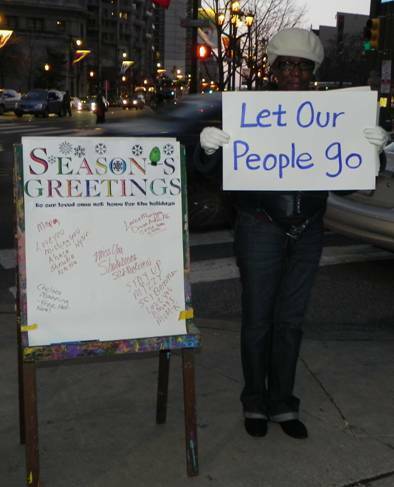 Karen Lee of Human Rights Coalition and Saving Our Loved Ones (SOLO) next to a holiday card that all could sign. Photos and Report: Justice for Our Children! Keep Children’s Court Open to the Public! On Wednesday, December 18th mothers, grandmothers, fathers and other supporters joined together outside LA Children’s Court to oppose re-closing LA’s Juvenile Court to the public. The California Appeals Court had released a tentative decision to close Children’s Court, hearing final arguments on Thursday, Dec.19th. Organized in just a few days by DCFS Give Us Back Our Children and Every Mother is a Working Mother Network, the press conference, vigil and speak out said that dependency court secrecy puts children in danger. Among large metropolitan areas, LA County has one of the highest rates of removing children from their families, with 34% of them Black, while children needing protection don’t always get it. The same day, Dec. 18th, the Los Angeles Times carried a front page report that found fully 1/3 of children in foster care in LA County suffer abuse and some have been killed. There was a hard fought and successful battle to end the secrecy in LA’s Dependency Court resulting in Judge Michael Nash, the Presiding Judge of LA Juvenile Court, ordering in January 2012 that Children’s Court be open to the press and public. The aim was to improve accountability and transparency. His order does protect children’s privacy by allowing minors and family members to request the court be closed to the public and press when their case is being heard. Dependency courts have been opened in over a dozen other states with no negative impacts. If the appeals court closes them, California would be the first state to re-close these courts after they’ve been opened. Dependency Court lawyers and the union representing social workers have long opposed opening the courts. Determined to show support for keeping Children’s Court open so important decisions that impact removing children from their families are not made without public knowledge, we gathered outside the court with signs, banners and raised voices. The vigil included representatives of DCFS Give Us Back Our Children, Every Mother is a Working Mother Network, the Global Women’s Strike & Women of Color/GWS, the Womenscircle@OccupyLA and other family members whose children are being detained by LA Department of Children and Family Services (DCFS). Others who also supported this action pressing to keep the court open include: Alexandria House; Californians United for a Responsible Budget; Art Goldberg, Working People’s Law Center; Mimi Kennedy, actress; LA Community Action Network; Mary Sutton, LA No More Jails Coal & Critical Resistance; Western Regional Advocacy Project; and the Youth Justice Coalition. 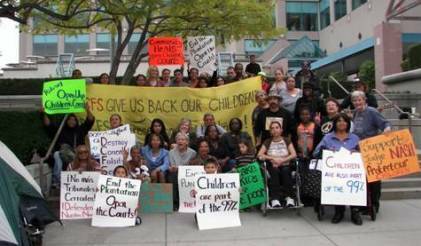 URGENT ACTION ALERT Justice for our Children! Keep Children’s Court Open to the Public! 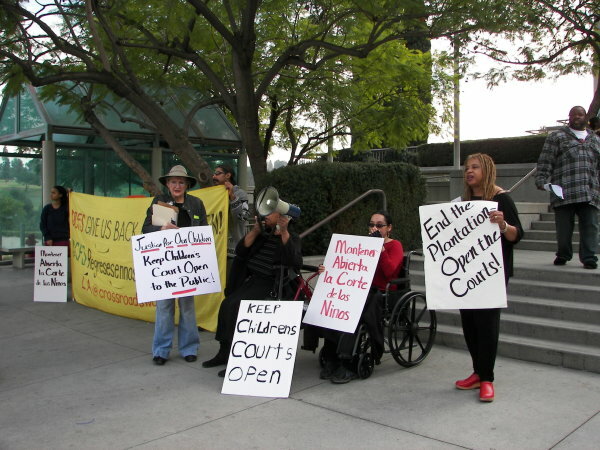 There was a hard fought and successful battle to open Children’s Court BUT NOW, the California Appeals Court is about to rule THIS WEEK Dec 19th that Children’s Court must be closed. Thursday, Dec. 19th, gather at 9:30am CA Appeals Court, Reagan State Bldg, 300 S. Spring St. on the 3rd floor. Case will be heard at 10:30. Come support children, mothers, grandmothers. Keep Children’s Court Open! This article is the second of a two-part series on charges of racial bias in the child welfare system in Philadelphia. This article is part one of a two-part series on charges of racial bias in the child welfare system in Philadelphia. Part two looks at the uphill battle fought by parents or relatives seeking to regain custody of their children. We invite you to endorse a candlelight vigil for families torn apart by being unjustly removed from their families by the Department of Human Services and the foster care system, prison, war, poverty, immigration policies … The vigil is being held on Wed December 18 from 4:30-5:30pm outside of the Department of Human Services. 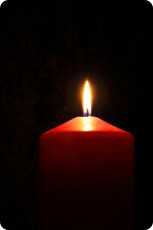 Please come and light a candle for your loved one who is not home for the holidays and speak out about their situation. Join Carolyn Hill in lighting a candle for a loved one not home for the holidays because in foster care, group home, prison, solitary confinement, psych ward, juvenile or immigrant detention, nursing home, a juvenile lifer, poverty draft …. Add your loved one’s name who is not home for the holidays in the comments here, or on the Facebook page . To endorse the vigil, please click here. Reunite military refuser Kimberly Rivera with her newborn son and family! Kimberly Rivera is a soldier and mother of five imprisoned for refusing to redeploy to Iraq. Rather than grant her clemency in the last few weeks of her sentence, the military separated her son from her after she gave birth in prison last week. She has not been allowed to breastfeed or bond with her newborn. For the latest news and what you can do, see the Free Kimberly Rivera website. We at the Crossroads Women’s Center in Philadelphia are shocked and outraged that a mother and child are being prevented from bonding and breastfeeding because the mother refused to harm others. This is a terrible, unnecessary, and cruel and unusual punishment for mother and baby. Breastfeeding is not an optional extra. It provides essential lifelong physical and mental health benefits. Please release Kimberly Rivera immediately so she can nurture and provide her baby with the best start in life. You are punishing caring and rewarding killing.